UW-Madison graduate student Molly Harris has not served in the military, nor have her brother or parents. She finds the situation fairly common among her peers. The civilian-military divide led her to partner with the Wisconsin Veterans Museum on the Warrior Book Club. Begun last fall, it brings together veterans and non-veterans for discussions about literature dealing with combat and its aftermath. 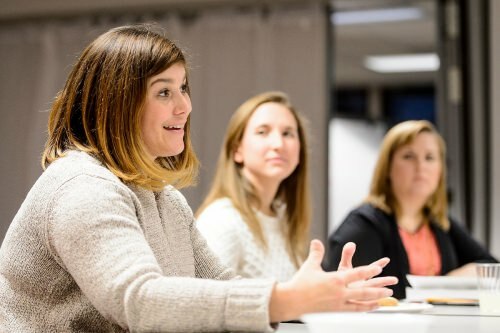 “My hope is to connect people who might otherwise not be talking and create a robust dialogue around the challenges veterans face when they return from war,” she said. Harris, who’s from suburban Chicago, is working on a doctorate in classical and ancient Near Eastern studies. 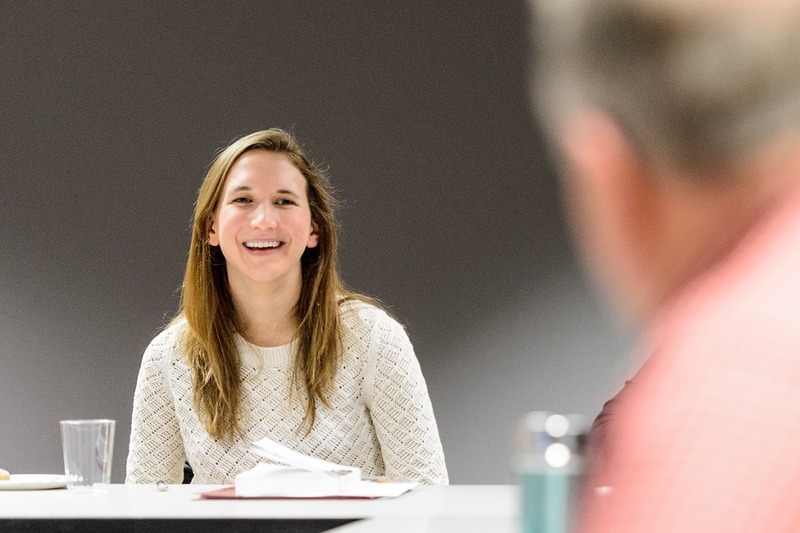 She studies how Greek tragedy portrays the impact of war on families and communities, and she is incorporating ancient texts in the book club selections. Harris undertook the book club project in addition to her coursework. She is supported by UW’s Center for the Humanities, which provides stipends each year to a select number of graduate students for innovative projects with community partners. The book club meets at either the museum, 30 W. Mifflin St., or the central branch of the Madison Public Library, 201 W. Mifflin St. It has 18 members this semester, representing a cross-section of the community and the campus. Another member, JoAnn Damkoehler, served 20 years in the U.S. Air Force before retiring in 1999. She appreciates the mix of people in the club. When Harris approached the museum about her idea, its staff already was planning to launch a project called the Warrior Book Club, though the club had yet to meet and the books had not been chosen. Harris and her concept – reading both ancient texts and contemporary works – proved to be a great fit, said Erin Hoag, the museum’s curator of education. Harris went on to facilitate the club with the museum’s assistance. Harris said her interest in war literature grew out of studying ancient texts such as Homer’s “The Odyssey” – a story “that has commemorated a veteran for over 2,500 years,” she said. Historic works provide valuable insight for modern-day discussions about combat, Harris said. 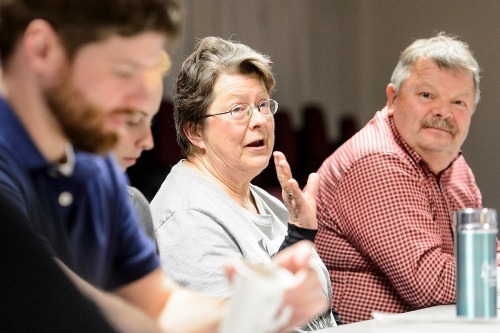 She hopes members come away with an appreciation for their continued relevance. Last fall, the books chosen for the club loosely addressed the theme “over there:” the Greek tragedy “Philoctetes,” the modern classic “The Things They Carried” by Tim O’Brien, and “Redeployment,” a short story collection by Phil Klay that won the 2014 National Book Award for fiction. This spring’s theme is “re-entry.” All of the books relate to coming home. 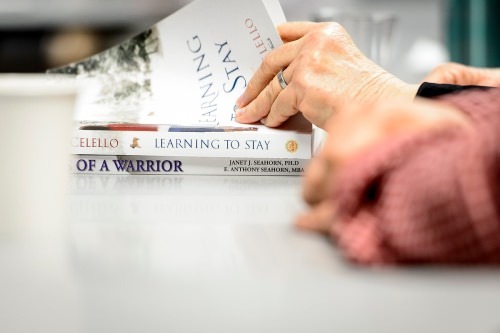 At the March meeting, the group discussed “Learning to Stay,” a well-regarded 2013 novel (also adapted into a play) by Madison-area author Erin Celello about a soldier returning from Iraq with a traumatic brain injury. Celello joined the group as a guest. Her husband, John Adams, an Army veteran, said he was pleased to see so many new faces beyond those typically drawn to events at the museum. “I’m just wowed by the interest from the university community,” he said. The age range of those present spanned decades and included several people in their 20s, two of them current UW–Madison students and others recent alumni. Harris let the discussion unfold largely organically, offering a gentle prompt here and there to spur additional thoughts. Dale Holmen, a non-veteran, said that unlike earlier wars, at least people now are talking about PTSD and traumatic brain injuries, even if the long-term effects are not clear. “Battle fatigue — they called it battle fatigue,” added Damkoehler, the Air Force veteran. By the end of the two hours, the discussion had broadened to include an appreciation of the strides made by military women and debate over the extent of sexual harassment in the workplace, military or otherwise. Hoag, a veteran of the U.S. Coast Guard Reserves, said she sees immense value in creating spaces for veterans and civilians to interact in meaningful ways. New book club members are welcome. To register or for more information, see the museum’s website here or call 608-264-7663. For information on the Center for Humanities and its Public Humanities Exchange, see here. The next application deadline is May 5 for community partnerships that would begin in spring of 2018.